The DEA’s listing of Kratom as Schedule I is bad for research. The DEA’s draconian drug policies have already made medical marijuana research more difficult. Capsules of the herbal supplement Kratom, which may be classified a Schedule I drug as soon as Sept. 30. If there’s one thing that pharmacology researcher Susruta Majumdar believes in, it’s the power of research. So when he decided to take on one of the biggest problems in medicine, he assumed research would help. The problem at hand? The best tools available for treating pain, opioids, are also highly addictive, and the resulting addictions and overuse of these drugs kill thousands of people each year. The possible solution? Something that could kill the pain but not cause the same addiction. He found what he was looking for in the Kratom plant. Native to Southeast Asia, Kratom has a long history of use as a medicine and opium substitute. The plant had been studied, in the U.S. and Japan, but showed little promise. Majumdar thought new research techniques suggested a second look was warranted, and initial work (conducted at Memorial Sloan Kettering Cancer Center and complemented by that of colleagues at Columbia University) suggests that Kratom contains a weak opioid, mitragynine, which interacts with the brain in novel ways. There’s hope that it might be possible to create an opioid that treated pain but lacked the risk of dependence or overdose. After three years’ worth of research, Majumdar thinks Kratom might be the most promising opioid alternative we’ve got. But so far we’ve only done research in mice: Much more work remains to be done to see if mitragynine pseudoindoxyl or any other Kratom-related compound could be developed into a new and improved pain drug for humans. Given the current opioid crisis, it’s worth doing the work to find out. Unfortunately, that may never happen. Fueled by reports of the drug’s possible dangers, the Drug Enforcement Administration recently decided it would list Kratom as a controlled substance, which will make it much harder for researchers to study the promising new compound. Kratom is currently completely unregulated in the United States, though the drug has developed something of an underground following—people claim to use the plant as a sort of herbal Suboxone to treat their chronic pain or opioid addiction. But that self-medication has had its problems. 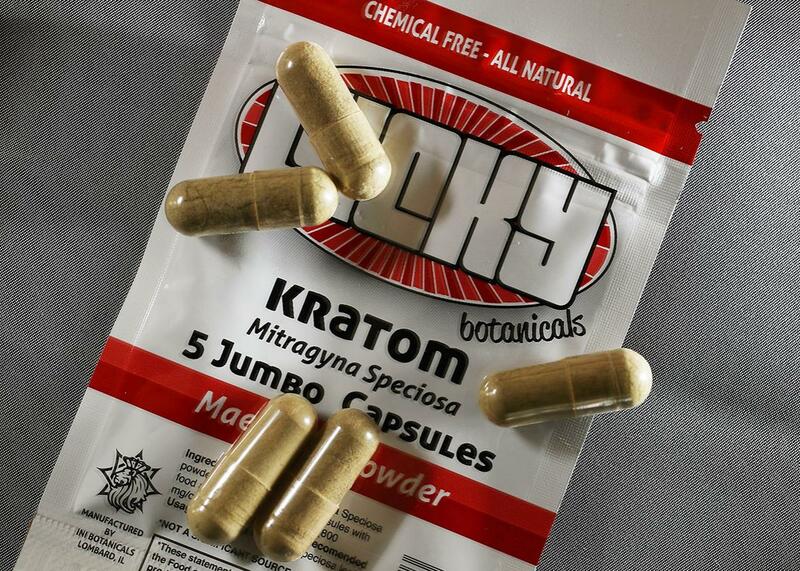 Between 2010 and 2015, there were 660 calls to poison control centers due to Kratom, and between 2014 and 2016, there were 15 Kratom-related deaths in the U.S. Those figures were cited when, on Aug. 30, the DEA announced its intention to place the active components of the plant—mitragynine and 7-hydroxymitragynine—into Schedule I, the most restrictive category of controlled substances in the U.S., the same category that contains LSD, heroin, and marijuana. These substances are defined as having a “high potential for abuse,” no “currently accepted medical use,” and are considered unsafe even under a doctor’s care. That means that unlike drugs in schedules II through V, a doctor cannot prescribe them, and researchers need a special license to study them. In listing Kratom as Schedule I, the DEA seems to be creating a catch-22: They’ve banned a substance for having no accepted medical use, but that makes it unlikely a medical use will be found and accepted. Of course, the obvious parallel here is the current situation with marijuana. The DEA announcement on Kratom comes on the heels of its Aug. 11 rejection of two petitions to reschedule marijuana to a less restrictive category that would allow researchers easier access to the plant (all the more ridiculous when considering that medical marijuana is legal in half of the states). The DEA argued that there was still insufficient evidence that marijuana has a currently accepted medical use, according to spokesman Russ Baer, but the very research that could provide that evidence has been hindered by DEA restrictions. For many years, the DEA has allowed only the University of Mississippi to grow marijuana for research (though that allowance may soon change), and it hasn’t yielded enough to supply all researchers who want it. That type of growing arrangement could be even more difficult for Kratom—it’s proved hard to get the plant to produce the same chemicals when grown outside its native environment. Baer has pledged there will be “an adequate and uninterrupted supply of research-grade” Kratom, though it’s unclear where they’ll get it. Unfortunately, according to Baer, the DEA really doesn’t have the latitude to place Kratom in a less restricted category. The DEA’s authority is derived from the Controlled Substances Act, the 1970 statute that set up the drug scheduling system. The law charged the DEA with protecting the public from potentially hazardous drugs like Kratom but also gave the agency a limited toolbox for the task: It must adhere to the act’s standards. The DEA decided to emergency-schedule Kratom because it has been implicated in people’s deaths, and because of the criteria set by the Controlled Substances Act, the only available category is Schedule I. In other words, don’t just blame the big, bad DEA. Blame the law. Where this leaves Majumdar and his colleagues is still unclear. His team plans to apply for the Schedule I research license and cross their fingers that the DEA can in fact supply them with sufficient and quality Kratom. In the worst-case scenario, they will begin looking for some new compound and start work from scratch. That, Majumdar says, would be a shame: “There are fundamental neuroscience questions we can answer with Kratom.” If only they could easily study it.